Samsung innovates with a retractable camera and rotating that can take advantage of three sensors to make selfies. A mid-range smartphone that exhibits a completely borderless display to provide an optimal display surface. After introducing the A70 for low budget, Samsung has announced its new mid-range smartphones in the A-series. 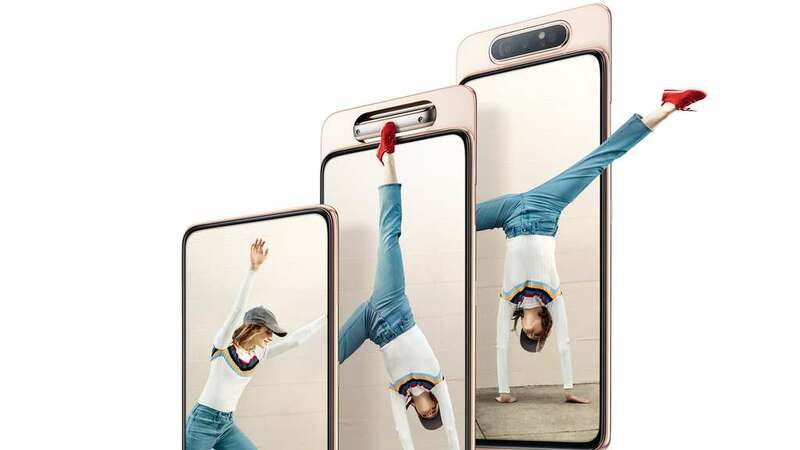 At the top of the poster is the new Galaxy A80, a smartphone with a giant screen without edges or notch, as well as a retractable camera that pivots for selfies. The South Korean manufacturer has detailed the features of this completely atypical smartphone. The only big unknown is the processor that was just announced as an octa-core (2.2 GHz and 1.8 GHz). All would suggest that this is the Snapdragon 730 Qualcomm. Samsung identifies very clearly the intended audience, naming the digital natives. To allow them to share their experiences live anytime, Samsung has added a triple camera: a 48-megapixel main sensor, an 8-megapixel ultra wide angle lens, and a 3D Depth camera, a ToF sensor. ( Time of Flight ) which determines the distance of the objects. This allows you to evaluate the main subject of the photo and apply the bokeh effect in portrait or ” Live Focus ” mode; it can also be used for augmented reality, by measuring real objects or by creating a preview of virtual objects in the real world. If the camera should get a good score on the DxOMark test, it is at the level of selfies that the Galaxy A80 is completely different from the competition. The main camera is rotating, a motor lifts it, then turns the three sensors 180 degrees. This means that the selfies benefit from the 48-megapixel sensor, the ultra wide-angle lens, and the ToF sensor for portrait mode. The photos and videos will be of the same quality, regardless of the target side. A first in the world of smartphones! The retractable camera allowed Samsung to completely get rid of the notch for the front camera. The manufacturer has chosen to integrate a very large screen of 6.7 inches Super AMOLED (1.080 x 2.400 pixels ), devoid of edges, and called ” New Infinity Display “. Even the speaker has disappeared, integrated directly under the screen, just like the fingerprint reader. Other manufacturers can be expected to prefer the screen without edges with a photosensor that pivots like on this A80 or hidden in the slice as on the recent Reno of Oppo. Hard to compare the Galaxy A80 to other devices … Samsung A models are the mid-range, and the A80 is the top of the podium. However, its large screen without edges and without the notch, as well as its rotating camera, make a very atypical model. Nevertheless, it is closer to the Galaxy A9, while offering a larger screen – with 6.7 inches against 6.3 inches – a newer processor – most likely the Qualcomm Snapdragon 730 processor against the Snapdragon 660 – -, and the same amount of RAM(8 GB) and storage (128 GB). Note that the Galaxy A80 does not offer a microSD slot, and it is a weak point. Regarding the camera, the main lens goes from a 24-megapixel sensor to 48 megapixels, but the Galaxy A9 has a 2x telephoto lens, missing the Galaxy A80. The screen without a notch and without edges is innovative: the Galaxy A80 will not suffer much from the competition on this point. Big screen smartphones like Huawei P30 Pro (6.47 inches), Samsung Galaxy S10 + (6.4 inches), iPhone XS Max (6.5 inches) or Pixel 3XL (6.3 inches) all have in common. have a screen a little smaller, and especially with a notch or edge. In addition, these smartphones are more powerful, but also more expensive. Mid-priced phones, like the OnePlus 6T(6.41 inches) or Xiaomi Mi 9 (6.4 inches), bring more power for a price close enough but again, the Galaxy A80 wins the victory hands down screen side. Currently, the only smartphone to offer a screen without a slot and without edges is the Oppo Reno 5G; it incorporates a retractable front camera, but less powerful than the Galaxy A80 camera. The prices of both mobiles should be relatively similar, with Oppo outperforming the power ( SoCSnapdragon 855) and 5G compatible, while the Galaxy A80 wins for the selfies with the rotating camera. What price and where to find it? Samsung has announced availability from May 29 in Europe but did not announce the price at the conference, leaving some fears that it is too close to the Galaxy S10e, which is sold at 759 euros. Finally, it is through the release that it indicates a recommended price of 649 euros. It will be offered in three colors: gold ( Angel Gold ), white ( Ghost White ) and black ( Phantom Black ). The Samsung Galaxy A80 is hard to categorize. His rotating camera might as well be a master shot as a simple gadget. Only the use will say if it will become indispensable and if the moving mechanical parts will resist the wear. In any case, the screen and selfies promise both to be better than Samsung’s most expensive smartphone, the Galaxy S10 +. If the important thing for you is not to have the best Snapdragon processor, the Galaxy A80 offers an unconventional screen and photo and video features unpublished. The only downside is the limited amount of storage, which is more than enough for live streaming, but which will fill up very quickly during video recordings.